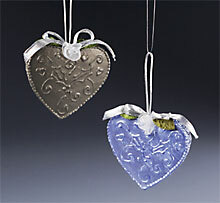 Faux “Tin” hearts are made of styrofoam*…but who would ever guess? Sheer silver wire-edged ribbon, 1/2″ x 1/3 yd. 1. Insert skewer into center top edge of heart. Holding heart by skewer, follow manufacturer’s instructions to apply surface finish to all sides of heart. Let dry. 2. Use pencil and transfer paper to transfer pattern to both sides of heart, or sketch own design. Use dimensional paint to outline designs. Outline heart edges with series of tiny dots, painted very close together. Note: Greater control and thinner lines can be obtained by squeezing paint into plastic squeeze bottle, then using narrow metal tip to draw. Let dry. 3. Follow manufacturer’s instructions to apply two coats faux finish to all sides of heart. Let dry. 4. Knot cord ends; glue knot into skewer hole in top of heart. Tie ribbon into bow. Glue bow and ribbon rose at base of cord.